Even the best of us commit the occasional type crime by accident or inattention. 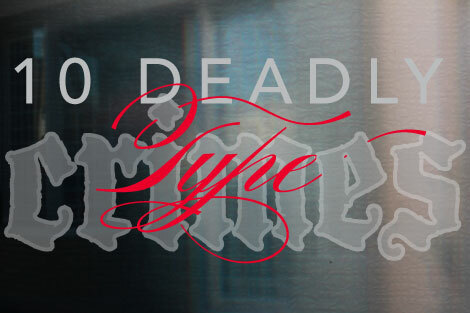 Knowing the “ten deadliest” type offenses will make you a better designer and result in projects looking more polished and effortless to read. As with all guidelines there are some rules that are worth breaking under certain circumstances. But you need to understand the rules that stem back to the days of original typesetting before you can break them. Distorting type by stretching or squishing is committing font murder. Instead adjust the spacing between your letters or choose a condensed or expanded typeface. The purpose of dumb quotes ("…") is to indicate inches and feet like 5'2". Their use to mark quotations is common across the type landscape. Reserve smart typographer quotes (“…”) for quotation marks and apostrophes. Say goodbye to the days of typewriters of when this practice started. Not only does this leave an ugly gap between sentences, it’s typographically wrong! All typefaces have built in fraction characters. Learn the keystrokes. Instead of using 1/2 to represent one half use the proper ½ character. It looks nicer and it takes less room. Computer pseudo styling is a sure sign of an impostor. Computer styling results in distorted forms that degrade your type and overall design. Dashes of different length have specific uses that every designer must learn. Hyphens (-) connect linked words and phrases, and they break words at ends of lines. En Dashes (–) connect numbers like 1–10. Em Dashes (—) express strong grammatical breaks. Visual emphasis can be created with just one signal. It is not necessary to bold, italicize, underline and set in all uppercase to make type stand out. Stemming back to the limitations of type for the web, a common practice has been to create graphics to incorporate designer fonts into a Web site. This is a big no-no for any type that needs to be read by screen readers or search engines. Thank goodness there is more flexibility with the introduction of web fonts. I am using web fonts on this blog. A widow is a word that sits on a line by itself at the end of a paragraph. An orphan is the last line of a paragraph that sits alone at the top of a column or page. Type does not like to be alone. Ugly gaps can occur as text is forced into lines of even measure. Avoid this by making sure the line length is long enough in relation to the size of type. With left and right alignment columns can lose their organic appearance and develop bad rags leading to legibility issues.